Dental Implant Options for Missing Teeth | Orange County Periodontists | Ajay B. Setya, DDS, MSD Robert C. Hirst, DDS, MS Christen S. Bergman, DDS., MS.
Dr. Setya will help you decide the best option for missing teeth. 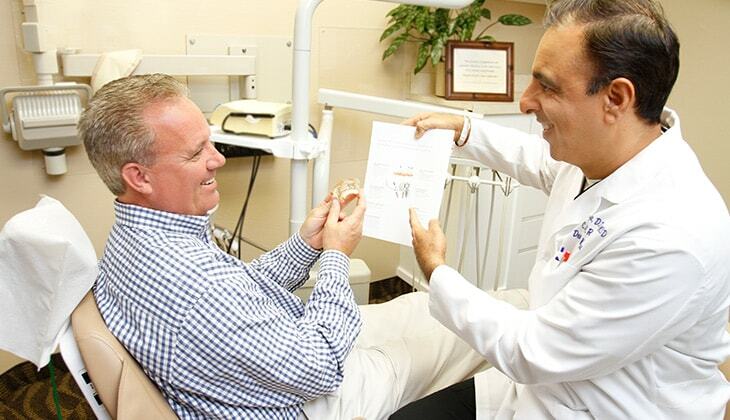 Dental implants are the most durable and natural-looking replacement option for missing teeth. They function, feel and look just like natural teeth and can last a lifetime. Dental implants are posts that act as replacement tooth roots, and are made out of either titanium or a bio-compatible ceramic. Dental implants can be used to support a single crown, a dental bridge or a denture. Because of recent technical advances in dentistry, most people are now able to receive dental implants and enjoy their many benefits. Below are our dental implant options. Dr. Setya places a dental implant to act as the root of a replacement tooth. A connecting piece known as an abutment is placed on top of the implant and acts as the attachment point for a dental crown. The implant-supported new tooth feels, functions and looks just like a regular tooth and can be brushed and flossed just like your real teeth. Patients have commented that they cannot tell the difference between their implant tooth and their natural teeth. Mini-dental implants are smaller in size than standard-sized implants and are sometimes an economical alternative in your implant treatment. They can be used for placing implants in very small spaces and sometimes can function to support a denture. Dr. Setya will tell you if mini-dental implants are an option and will happily answer your questions. Where several teeth in a row are missing, Dr. Setya can place a series of implants to support a dental bridge. 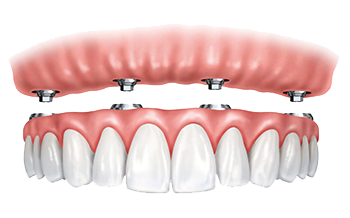 Implant-supported bridges have nearly the same biting and chewing power as regular teeth and provide the biting and chewing pressure needed to prevent bone loss under the bridge. A series of implant-supported bridges is the best replacement option for an entire arch of missing teeth as they provide the same flexibility as regular teeth and have nearly the same biting and chewing power. The most economical way to replace an arch of missing teeth is to use implants to support a new denture that can snap onto the implants but can still be removed by you. Both the implants and the underside of the new denture have attachments that allow the denture to snap onto the implants and hold the denture snugly in place. Your implant-supported removable dentures won’t need adhesives to be held in place, you will have about 60% of normal biting and chewing power, and you will be spared the pain and discomfort that comes from unsupported dentures rubbing against your dental arch. If you currently wear dentures, Dr Setya can sometimes place a series of implants on your dental arch and fit special attachments to the underside of your denture and the implants. These attachments will allow the denture and the implant to snap together, providing added support for the denture. There is an economical alternative to a series of dental bridges to replace a dental arch of missing teeth. If you are missing all your teeth or need all your teeth replaced, Dr. Setya can place four specially designed implants in your dental arch which will support new fixed-in teeth that can only be removed by the dentist. With the New Teeth in One Day procedure, you can now receive a full arch of replacement teeth in as little as one day!